Had a good start to 2018. Bagged three winners, while enduring one loss. Saw a small retracement during the uptrend, and went long on the break of the bearish candle. Went long on the NZDUSD again, but was quickly chopped out. This trade moved in my favour very quickly. 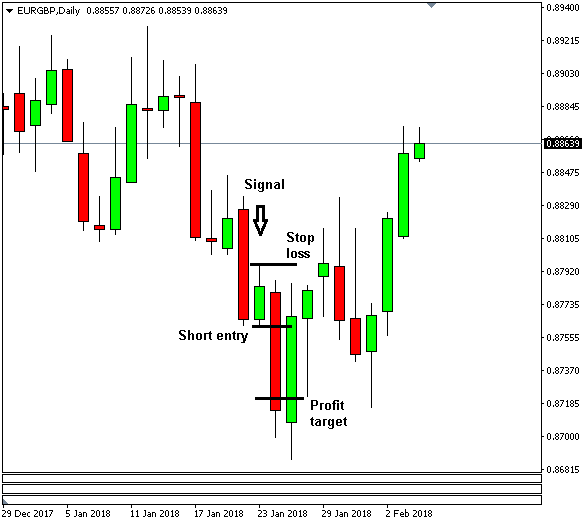 Went short on the EURGBP after a small retracement and bagged a win. With the holidays over, I began to spend more time on backtesting and research again. Fingers crossed for the rest of 2018! Anyway, this were my results for 2017. So I made a loss of -6.6% at the end of 2017. It's not a good thing. I initially started the year with blistering position sizes between 2% and 3%. I felt very confident after being profitable for two running years. By mid-year, my drawdown approached 14%. I'd begun reducing my position drastically to around 0.5%-1%. One particular trade blew a 5% hole in my trading account (mentioned here). 1) I traded less. In a way, this is a good thing. If you have a negative edge, you WANT to trade less, and ideally, not at all. But because I traded less, my self-identity as a trader began to fade. In my opinion, during extended drawdown, try to trade, but trade extremely small. A token position worth a few dollars may be preferable than nothing at all. At least you'll stay connected with the market, and get cheap feedback on your trading. 2) I spent more time on other hobbies. It's good to diversify your interests. But because I was doing other things, I spent much less time on research and backtesting, which impaired my self-improvement as a trader. 3) I began losing vision of my future. This is probably the big one. When your dream begins slipping away, it's very easy to grow disillusioned. You lose alot of motivation. Honestly, I don't have a solution to this, except to just keep grinding, and perhaps to keep your vision vague? I know some people recommend setting specific targets to hit, so you can find the most efficient strategy to hit those targets (e.g. to lose X kilograms per week, I need to reduce my daily energy intake by Y calories). But you can't do that with something as unpredictable as trading. Just take one trade at a time and execute. I made a list of what I think are positive and negative sources of edge here. This wasn't a random exercise. I wanted to see what I could implement (or get rid off) to get my trading back on track. Going into 2018, I'm sticking to a single strategy for now (low volatility breakout). I don't have full confidence in some of the other systems I developed. My #1 goal is to finish 2018 with a positive number. The size of that number doesn't matter, as long as it's positive. Just a rough summary that I scribbled in my notebook. Just a quick update on my trades for this year. I'm currently at a -2.95% loss for the year, just below breakeven. I'm not really happy, but it could be alot worse. This whole year has basically been a grind around the breakeven mark, falling behind, pulling ahead, and then falling behind again. I backtested all my systems up to the present and dropped those that stopped performing,. I'll wait until when (or if) they return to profitablity. Waiting is free. It's very important to have drawdown rules in place. Reducing your risk during drawdown will allow you to survive until your trading turns around. It's boring, but it has to be done. To be honest, I violated my own drawdown rules a few times, and paid the price. If I had been true to my rules, I'd probably be slightly profitable by now. During August, I risked 3% on a single trade when I should've stuck to 1%. I held the trade over the weekend, and the market gapped against me on Monday morning. I lost 5% when price opened way beyond my stop loss, more than the 3% I anticipated. 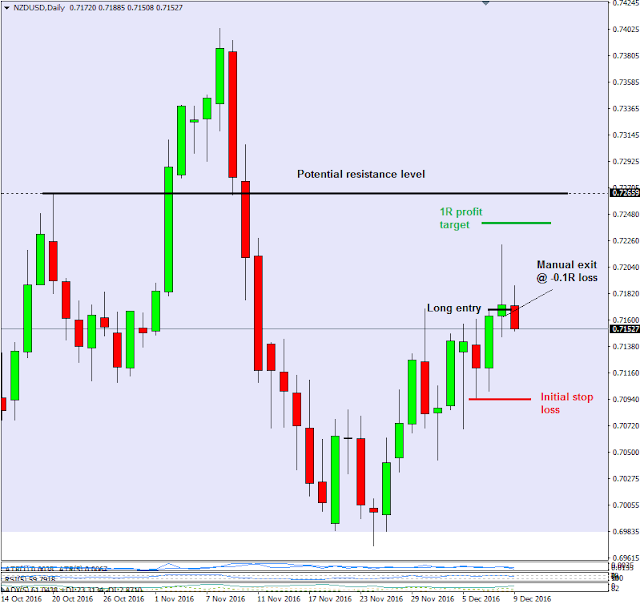 I might talk about this trade in a future entry as it provided a few key lessons - stick to your rules, and maybe reduce your risk when leaving a trade open over the weekend. It's also important to find interests outside of trading. During times of drawdown / breakeven, you'll want to find other sources of success or motivation in your life. It could be fitness, knowledge, or maybe a new skill. Don't base your identity solely on being a trader. Survive. Play great defence. If you truly are better, you will win in the end. And if you aren't better? A tight defence will keep you in the game indefinitely. Hey everyone, here's my performance review for 2016! This year I made a return of 15.3%. Most of that was made during the first seven months of 2016, which was then followed by slow, gradual drawdown which has thankfully stabilised over the last few months. Yeah, my profit factor for 2015 and 2016 are exactly the same. It's not a typo. Take note of the linear regression line, and how R^2 is 0.89. This is from real world results. That is beautiful. If you're wondering why the first half of the equity curve looks more volatile, it's because I traded with higher risk in 2015 (average 1.96% per trade), while in 2016, my risk was nearly half, at an average of 1.18% per trade. It's time to officially call myself a trader. After half a decade of learning and two years of consistent live trading, I've assembled a very good equity curve that I'm very proud of. That's real, hard cash that I've extracted from the market by myself. It's all real. At the start of the year, I opened a public Myfxbook account that I've maintained throughout 2016. It's been an interesting experience, but after a year, I no longer see much upside in continuing the account. I've noticed myself becoming anxious with people watching my trading account. What do I get out of it? I've considered trading other people's money and using Myfxbook to attract investors, but in the end, I feel better trading for myself only. It'd be nice (and lucrative) to trade other people's money, but there's alot of legal and psychological obstacles to overcome that can only erode my edge. And for me, trading is about freedom. So I plan to turn the account to private early next year. At this point, it's no longer about finding the "perfect" trading system. It's about finding and plugging all the leaks that erode my edge - physical, mental, financial, psychological etc. I'm taking inventory of everything. If it harms me, I'm letting it go. And that's that! A profitable year is a good year. Hey everyone. I only put on a single trade this week, which I fumbled as I'll explain below. I'm not happy with this trade. Not happy at all. Basically I saw a good bullish setup on the NZDUSD. According to my system, a reward-to-risk of 0.5R to 1R was ideal. I tended towards greed, and aimed for a 1R reward. 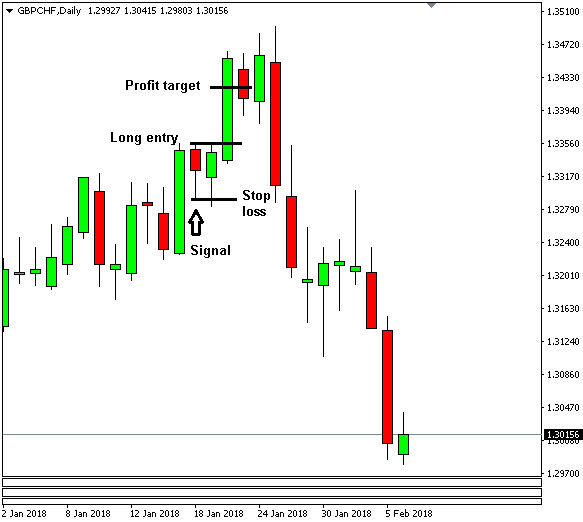 My profit target was below the next resistance level, so I thought it was still reasonable. Retail sentiment was slightly bearish (55%), which tilted the odds towards a bullish breakout. 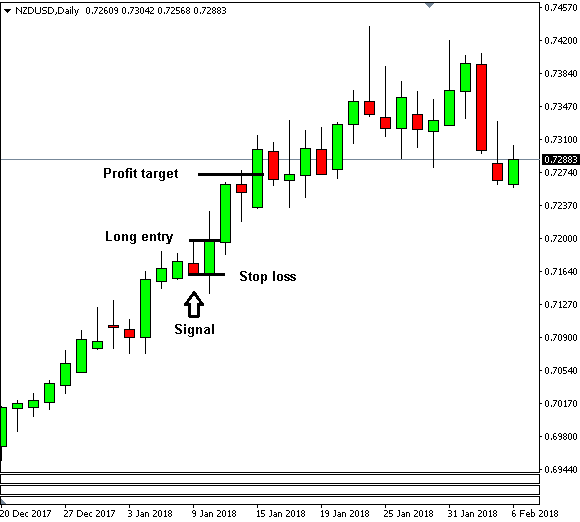 Price did breakout in my favour, and reached 75% of my profit target. And then the European Central Bank statement came out for that day, causing the NZDUSD to tank. I wasn't aware of this until an hour later when I logged on, at which point I promptly closed the trade near breakeven. I was away from a live chart and didn't realise how big the reversal was until an hour after the ECB statement came out. I honestly didn't think the ECB would influence the NZDUSD that much. I need to be more mindful of central bank statements, as central banks are the biggest players in the forex market. Anything that can move the EURUSD can spill over onto other pairs as the EURUSD is the biggest currency pair in the world. Plus the ECB and the US Federal Reserve are the two biggest central banks in the world. Respect. Price was between 0.5R and 0.75R before the ECB statement came out. It was within my profit-taking "green zone" for this particular system. My policy is to close profitable trades before big news, especially when it is near my profit target. But because I was away from the charts, I wasn't aware of the situation and didn't close the trade at a profit. While the reward of 1R was technically good, news events should be taken into consideration as well. Will my trade have enough time to reach its profit target before news comes out? If the answer's no, then a tighter profit target might be better (in this case, 0.5R to 0.75R). Posts or pages on forexiation.blogspot.com and the Forexiation blog do not constitute financial advice and do not take into account the individual circumstances and needs of traders or investors. The Forexiation blog / Kevin LaCoste is not a licensed financial advisor. This site should not be used to make trading, financial or investment decisions. Please do your own research and seek advice from a licensed advisor. 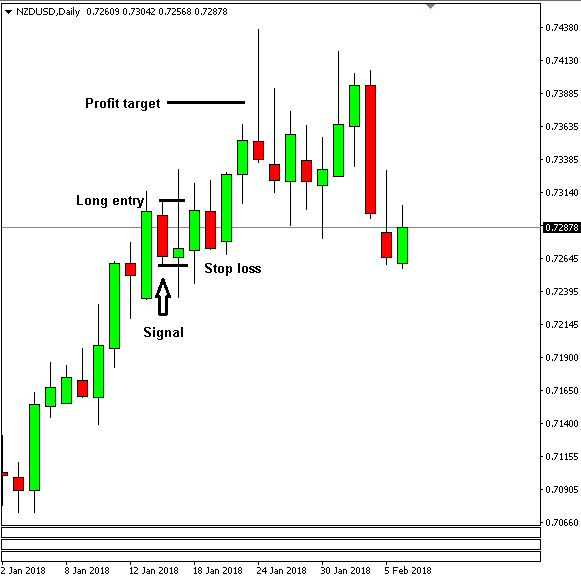 You must be aware that forex trading is very risky and can result in substantial financial losses. Forexiation / Kevin LaCoste is not liable for any trading, investment or financial losses.